We learned of the death of Mike Kelley ’54 this week and now mourn the loss of another friend. Mike’s Rice roots ran deep–his mother was Allie May Autry Kelley ’25 and his grandmother was Allie Kinsloe Autry, whose important role in the early history of Rice I wrote about just a couple of days ago. Growing up almost within sight of campus, he spent time as a boy at Rice football and basketball games and his choice of a college was a foregone conclusion. As a Rice undergrad he was active in the Canterbury Club, the Navy ROTC and the Rally Club. After graduating from the Harvard Business School he came back to Houston and took over the management of Kelley Industries, which he ran with great success until 1981. Mike Kelley also continued his family’s tradition of service to Rice University in almost numberless ways. He worked on the committee that wrote the proposal for the creation of the Jones School in the 1960s, served on Rice Fund council for sixteen years, and was a member of the Rice board from 1977 until 1987, resigning to accept an appointment as a Governor of the Federal Reserve Board. As a Rice trustee he chaired a task force that prepared the long-range plan for the 1980s and served on the search committee that chose George Rupp as Rice’s fifth president. 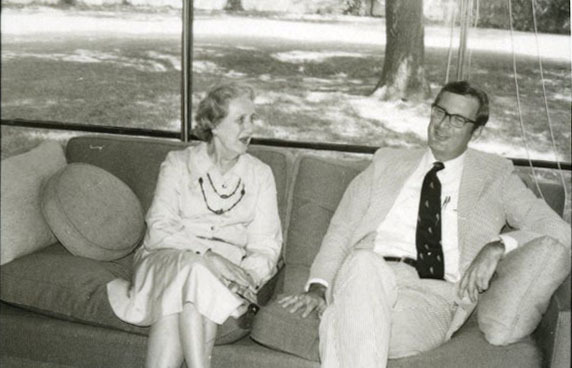 He was also especially interested in the library, funding the Kelley Center for Government Information, Data and Geospatial Services and the Kelley Suite that houses the Friends of Fondren offices, named in memory of his mother and his first wife, Ellen Elizardi Kelley ’55. To the Woodson Research Center he was a particular friend. His personal papers from his years on the Federal Reserve now reside in the Woodson as do the business records of Kelley Industries and the Autry Family Papers. Mike was warm and thoughtful, calm and kind. He was always a welcome visitor in the Woodson and we will miss him greatly. Mike Kelley, rest in peace.